For the longest time, my palateâ€™s intelligence for toffee has resembled my career in high school geometry: I liked the class and got a B, but I was nowhere near as good in it as I was in English (chocolate) and Science (gummi). Toffee always seemed likable, but I never ate enough of the stuff to be an aficionado. 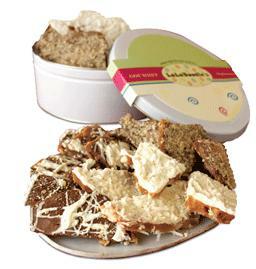 Toffee itself is a simple candy made by boiling sugar and mixing it with butter. Though most Americans identify toffee by the way it appears in Heath and Skor bars, it can take several forms. English toffee is a derivative that can be chewy, and honeycomb toffee is aerated, as found in Crunchie and Violet Crumble bars. Toffee tends to be a flavor spread around by the British, resulting in it being more popular in Europe and its colonies rather than in the U.S. When I was living in New Zealand, I was exposed to a variety of toffees of all different textures and tastes, which were never readily available to me back in the States. This inundation of the sweet created my craving for toffee that still exists today. 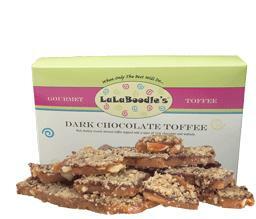 When I was offered to write a piece on LalaBoodlesâ€™ Gourmet Toffee, I couldnâ€™t turn down the offer. I had never sampled gourmet toffee, and the descriptions of what they produced were so enticing that I circled my mailbox for an entire week until they showed. 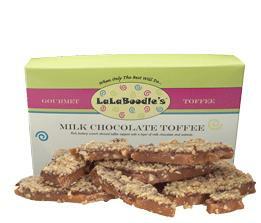 Classic milk chocolate almond toffee topped with walnuts. The toffee flavor in this one is strong, maybe a little too strong. It has the classic toffee part down, which is quite rich. The abundance and strength overpowers the taste of the milk chocolate and walnuts on top. I do get a sense of something more, but my palate canâ€™t separate the flavors. I like the inherent crunch, which is not sticky or hard, and the soft milk chocolate layer. Overall, it’s an enjoyable piece of toffee, but I wanted more of a taste of the surface. We take the freshest, fluffiest popcorn and generously coat it with our buttery toffee and whole almonds. This stuff tastes like gourmet Cracker Jacks. The toffee flavor is present, but not too bold, and avoids being overly sweet. It hits the perfect note. It also doesnâ€™t overwhelm the flavor of the popcorn, while the almonds add a nice crunch to it. Not sticky or coated too heavily. I really loved this. Dark chocolate almond toffee topped with walnuts. Like the milk chocolate piece, this one had the great toffee base, but the dark chocolate and nuts were drowned out. 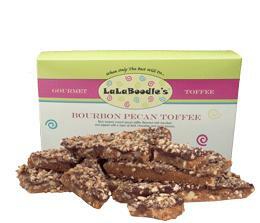 Toffee flavored with bourbon, packed with pecans, and topped with dark chocolate and more pecans. Following suit with the other toffee bars, the chocolate layer on top didnâ€™t make much of an impact for taste, but it was more noticeable in this bar. The bourbon flavor, which doesnâ€™t give the candy an alcohol aftertaste, combined with the pecans gives this piece a harmonic sweetness that counters the biting taste of toffee. The texture was also a lot smoother in this bite. 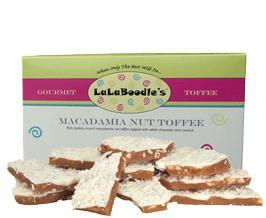 Toffee loaded with macadamia nuts and topped with white chocolate and sweet coconut. There were a lot of flavors battling here, and the toffee and coconut seemed victorious. The coconut is flavorful without the chalky texture of coconut shreds, and provides a creamy counter to the toffee. I couldnâ€™t detect the macadamia nuts or white chocolate because the other two flavors were bolder. It was a nice piece of Coconut Toffee to me nonetheless. Combination of the sensational New Orleans dessert classic, Bananas Foster, and gourmet toffee with just the right flavoring of banana and rum, and then drizzled with white chocolate. All the flavors seemed amazing from their descriptions, and I saved this one for last because it sounded the most delicious. 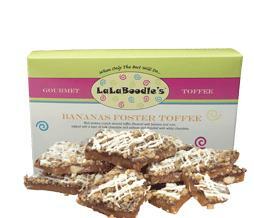 The Bananas Foster flavor is spot-on, bringing a fresh tropical twist to the standard toffee. Like all the other toffee pieces, I couldnâ€™t taste the chocolate that layered it. It was a very satisfying piece of Bananas Foster Toffee (minus the white chocolate part). 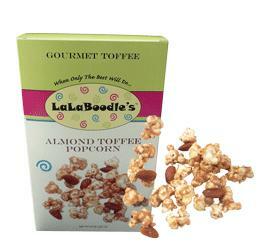 So, after sampling nearly all of the LalaBoodleâ€™s catalog, I have a mixed verdict. As far as the toffee goes, itâ€™s exceptional. If youâ€™re a toffee enthusiast or just a fan of good candy, you will most likely enjoy anything from them. My only misgivings come from the absence of flavor present in the chocolate and nut surfaces. I think a thicker coating of the stuff might enhance the product. My personal recommendations are the Toffee Almond Popcorn (really, it was just perfect in every way), Macadamia Nut Toffee (for coconut, not macadamia nut lovers! ), and the Bananas Fosters (probably the most well-executed of the bars they sent). Oddly enough, one of the only things I didnâ€™t get from them was their Almond Brickle, which is their toffee minus the chocolate or nut layering. Though I havenâ€™t tried it, I would be willing to say that it might be the most appetizing thing they sell since the toffee is truly their best product and need not be adorned any more than gourmet toffee already is. i love toffee– LOVE IT. the combination of sweet/salty/buttery is just about the greatest thing ever. the recipe is pretty simple so i usually just make my own, but LaLaBoodle was on sale at Amazon a while back so i gave it a try. i had the white choc coconut variant, and i thought it was REALLY sweet without any salty bite at all. def not my favorite. what kind of name is lalaboodles ya know? Great blog! I’m gonna read about 3 years of archived candy addict in the next few weeks… yay! Also I see that chocablog is not on your blogroll. I suggest you check them out, they are another really good candy blog, except only chocolate (ohhhyeahh), and mostly british and australian writers. Very interesting. Can you tell I love me my sweets? I love toffee, but hate nuts. Its a shame, because these look goooood. Those look DANG good. I love trying new candy like this… but I hate having to pay all of that expensive shipping. I love Bananas Foster, and I HAVE TO try this. Dang budget. NOTE: They are currently shut down until about Monday, August 25th. They are taking orders, but not making them. I love toffee and have pretty much tried them all including Brandini toffee and LaLaBoodle’s toffee is by far the best I have ever eaten. The Milk chocolate toffee is to die for! My favorite is the Almond Toffee popcorn…Robby is right when he states it is perfect. Haven’t tried all the flavors yet but I am working on it. I just ordered the Bourbon Pecan. You need to try Brandini toffee. Awesome stuff.